European Union regulators slapped Google with a record €2.4 billion ($2.7 billion) antitrust fine on Tuesday, the latest broadside fired at big American tech companies doing business in the region. The European Commission found that the U.S. tech giant denied "consumers a genuine choice" by using its search engine to unfairly steer them to its own shopping platform. Regulators said that Google must change its behavior within 90 days or face additional penalties. "What Google has done is illegal under EU antitrust rules," said Margrethe Vestager, the bloc's top antitrust official. "It denied other companies the chance to compete on the merits and to innovate. And most importantly, it denied European consumers a genuine choice of services and the full benefits of innovation." Google (GOOGL) said in a statement that it tries to show ads in ways that are helpful for buyers and sellers. "We respectfully disagree with the conclusions announced today," a Google spokesperson said. "We will review the Commission's decision in detail as we consider an appeal, and we look forward to continuing to make our case." The Commission said that Google acted illegally by giving priority placement in search results to its own shopping service, while relegating results from rivals to areas where potential buyers were much less likely to click. 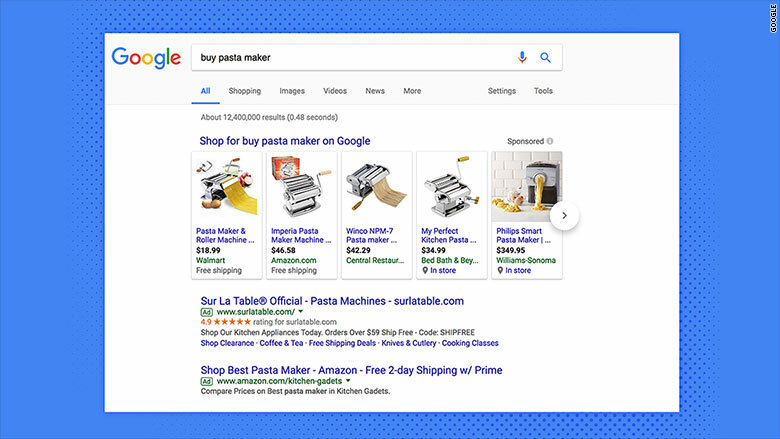 Google Shopping box is displayed above other results. It could have fined Google as much as 10% of its annual sales, or roughly $9 billion. The $2.7 billion fine represents just over 2.5% of Google's revenue last year and Alphabet, Google's owner, had $92.4 billion in cash as of end of March. 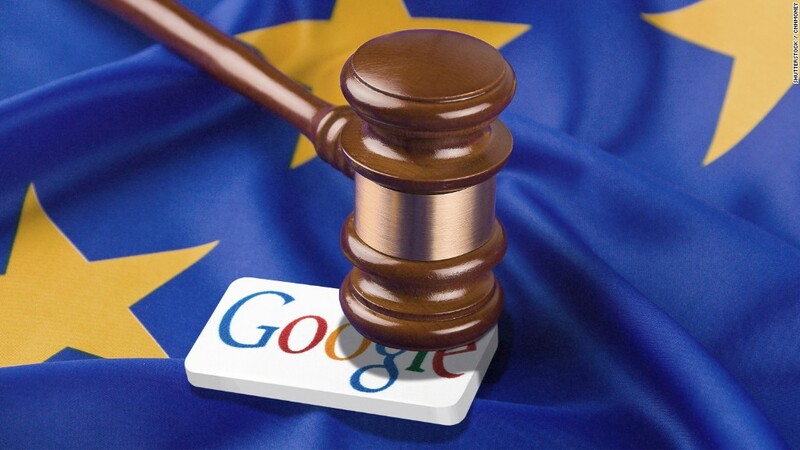 Vestager said Google's competitors could claim compensation in national courts within the EU. She said hundreds of companies, including some based in the U.S., complained about the way Google displayed its shopping service. Shares in Alphabet dropped by 1.2% in premarket trading. Tuesday's fine dwarfs the previous EU record antitrust penalty of €1.06 billion ($1.2 billion) imposed on Intel (INTC) in 2009. Intel has been fighting to overturn that decision ever since. Google's regulatory headache in Europe doesn't end with the online shopping case, which dates back to 2010. The EU has also accused the Silicon Valley titan of abusing its market position by imposing restrictions on Android device manufacturers and mobile network operators. It is also investigating the company's ad placing service, AdSense. American firms have come under increased scrutiny in Europe on issues related to tax and competition. Apple (AAPL) is fighting a European demand that it repay €13 billion ($14.7 billion) in back taxes to the Irish government. Facebook (FB) was fined by antitrust regulators in May for misleading officials over its takeover of messaging service WhatsApp. The same month, Amazon (AMZN) agreed to change its distribution agreements with e-book publishers to address antitrust concerns raised by the Commission. And in early June, antitrust officials launched investigations into claims that Nike (NKE) may have broken EU laws by restricting how traders can sell licensed merchandise. Comcast's (CCV) Universal Studios is being investigated on the same grounds. Vestager rejected any suggestion of anti-American bias, telling reporters on Tuesday that an analysis of investigations her department has launched found that U.S. companies were not being disproportionately targeted. -- Paul R. La Monica contributed reporting.